A stock aircraft called Boeing 747 Shuttle Carrier. Built with 203 of the finest parts, its root part is mk3Cockpit.Shuttle. 3) When launching hit Hot key #4 to disable afterburners. 3) At 2 Km altitude and 200 m/s open the rear cargo door using hot key #1 then ignite the rocket engines through staging or hot key #2. 5) Continue boosting until apogee is above 100 KM. This will give you enough time to put the Shuttle into orbit and switch back to the 747 before it re-enters the atmosphere. 6) Once apo is above 100 Km kill the engines and separate the Shuttle through staging. It’s a good idea at this point to move the Shuttle away from the 747. 7) Turn the 747 back toward the Kerbal Space Complex and initiate the boostback sequence. Thrust toward KSP keeping the craft’s nose on the horizon until you run out of rocket fuel (Oxy). There should still be plenty of liquid fuel left. 8) Tab over to the shuttle and boost it into a stable orbit. 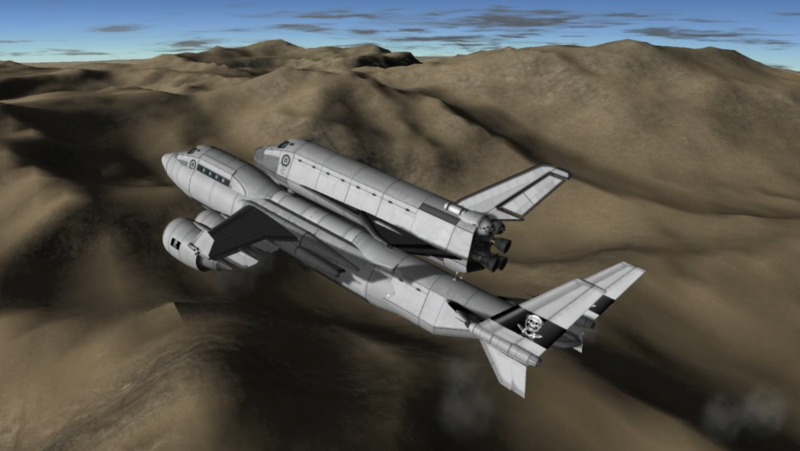 10) As you re-enter the atmosphere the nose of the craft will tend to drop - that’s OK you should be travelling slow enough that nothing will explode, but you will want to pull the nose up as you enter (parachutes on the rear of the craft should stabilize you if you lose control). 11) Once back in the atmosphere simply fly back and land at KSC.